Get atleast 8 hours of sleep a day. In this way, you will have a more productive and cortisol free day! Is running in the morning good for you? Some advocates says yes and that your body is empty of food so that you will be burning directly from your fat storages. We are not sure if this is entirely correct but what we do know is that cortisol levels are highest in the morning which means your testosterone levels are much lower. This being the case, the morning MIGHT not be the best time to run! There are tons of products on the market. We are currently testing some out and will come back with the results. Remember to sign up for our newsletter on the right to find out which ones actually help you block cortisol levels from increasing! To save money on supplements, SupplementDiscounts.net is an awesome site to find supplement deals! Cortisol helps restore homeostasis after stress. It counters insulin and promotes the breakdown of proteins and lipids. Too much cortisol secretion causes hypergllycemia. 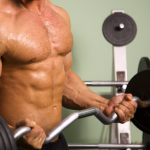 When a person does intensive strength training, the body enters a catabolic state. The body breaks down more and more muscle proteins as fuel because of an inadequate supply of carbohydrates.Cortisol and ACTH are released and begin to break down amino acids for process of protein synthesis.